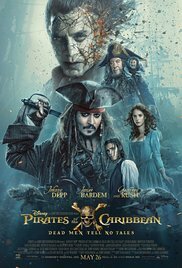 Pirates of the Caribbean is back with the fifth flick in the franchise and it is by far better in my opinion than the fourth. The cast includes old favorites and new faces alike: Johnny Depp, Javier Bardem, Geoffrey Rush, Brenton Thwaites, Kaya Scodelario, Kevin McNally, Orlando Bloom, Kiera Knightley and many more. Dead Men Tell No Tales follows a young man trying to save his father from a curse. So his best bet is to receive help from a girl who can read a mysterious map and also, of course, find Captain Jack Sparrow to help him in search for the Trident of Poseidon -- an artifact that breaks any "curse at sea." It sounds way too good to be true but Jack's luck seems to have finally run out and the Trident may be his last hope. What I liked about Dead Men Tell No Tales more than On Stranger Tides was the return of old characters we know and love. The story had action, comedy, love, and the expected ridiculous antics Captain Jack brings to the table. Again, it reminded me of the first couple movies in the series and was real fun to watch. I sort of wanted it to be longer to see what was Jack's next adventure. Hopefully, the rumors are true about a possible sixth. Stick around until after the credits as well -- there is a short scene that hints at what a possible sequel might entail.